Manhattan, 2080. Ruined by decades of war and global crises, the city is now home to those that can’t or won’t fit in elsewhere. 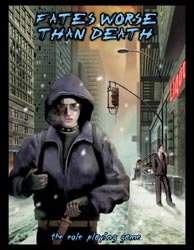 The city is little more than an anarchy, plagued by every imaginable evil and horror, from self-reproducing serial killers to pusher gangs who hold down people and force them to use drugs. Powerful & flexible character creation system. Choose from 46 occupations and gang affiliations encompassing every segment of city society. Realistically lethal combat system encourages players to think, rather than fight. ‘In brief’ boxes let readers skim through for general info and dive in for more details. An incredibly detailed look at one real city, describing every aspect of the city and the people who live there. Fan Rewards: Gain access to free supplemental materials and get free stuff at www.fatesworsethandeath.com. Detailed random encounter tables let GMs easily turn a walk down the street in to an adventure. Printed Book, US Orders: $16.48 +$5 S&H. Fulfillment by Vajra SPECIAL NOTE: From 10/11/16 to 10/11/16, orders fulfilled by Vajra may be delayed up to 10 days before shipping. Printed Book, International Orders: $16.48 +$15 S&H. Fulfillment by Vajra SPECIAL NOTE: From 10/11/16 to 10/11/16, orders fulfilled by Vajra may be delayed up to 10 days before shipping.